“Your identity has nothing to do with your passport.” An observation that proves increasingly valid today. 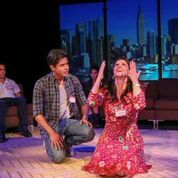 In a U.S. premiere at the Horizon Theatre Rep, Jalila Baccar’s play, Araberlin, illustrates the point with the story of Mokhtar, a young Lebanese-Palestinian student studying in Berlin who disappears without a trace. He is accused of being a terrorist. With challenging complexity, Araberlin examines the cross-currents of the Arab Spring and its consequences throughout the Arab world and beyond. It is a multilayered play with enigmatic characters and often stilted dialogue. 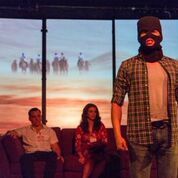 Directed by Rafael De Mussa, Artistic Director of Horizon Theatre Rep, Araberlin digs into the fear, suspicion and violent hatred prevalent in society today. Like the Arab student in Berlin, identities become muddled, cultures divided, here illustrated by the terrorist accusation of Mokhtar and its effect on his family, community and Katarina, his Bavarian girlfriend, all German residents. Mokhtar was studying architecture and living with his German/Palestinian sister, Aïda (Lisa LaMattina), her German husband, businessman Ulrich (Rafael De Mussa) and their teenage son, Kaïs. He breaks the news to Katarina that he is leaving. “There’s too much blood, too much violence. Those who truly love justice have no right to love.” Mokhtar’s speech, like most of the speeches in the play is a poetic, strangely formal statement, delivered facing the audience. When the state and press accuse Mokhtar of being a terrorist, his family (both German and Palestinian) suffers. Like the distraught Katarina, they are harassed by the police and press. Former friends shun them as they worry about Mokhtar, begin to turn against each other and are caught in a maelstrom as the drama of disbelief, acceptance and understanding unfolds. Aïda and Ulrich’s son, Kaïs, was close to his uncle Mokhtar and influenced by his philosophy, and alternately confronts his parents or avoids them completely. He doubts his own identity. Additional cast members form a group that could be a choir or theater group, or a political cell, or a crisis center or a moveable mix. 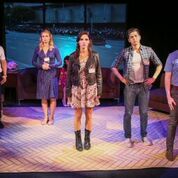 Five actors, Malin Barr, Gabriel Diaz DeSalas, Lisa LaMattina, Scott Mandel, Elena Rusconi, and Rafael De Mussa take on various roles, interacting, interpreting and questioning. They form a chorus that is amorphous, much like the issue of terrorism that grows and regroups into mosaics that can be befuddling. News clips run intermittently behind the performers, adding immediacy. Araberlin was translated by David Looseley, made possible with a generous grant from The French-American Fund for Contemporary Theater of FACE Foundation.. It was first staged in Berlin, at the Drama Festival, on 17 September 2002. The creative team for Araberlin is comprised of: Yuriy Nayer (lights), Ari Fulton (costumes), and Aristides Li (sound/QLab programmer) and Rafael De Mussa (set/video). It opened on July 2 through July 19, 2015 and runs 90-minutes with no intermission.